For information on the 6th -8th grade Middle School - Countdown to the Math STAAR and Countdown to the Algebra EOC. 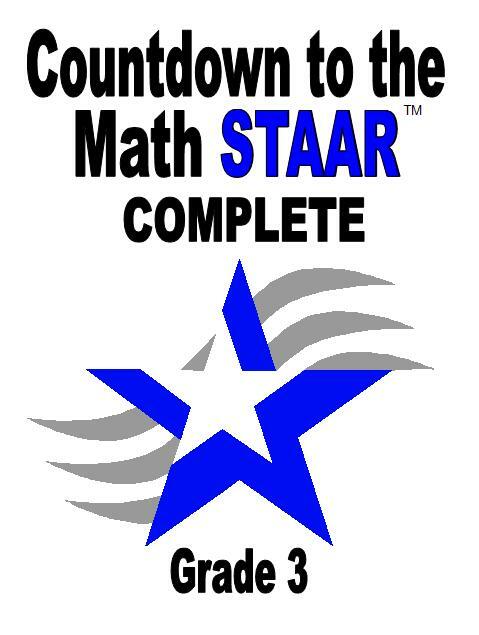 The new Countdown to the Math STAAR gives your students valuable practice and gives you a powerful assessment, too! 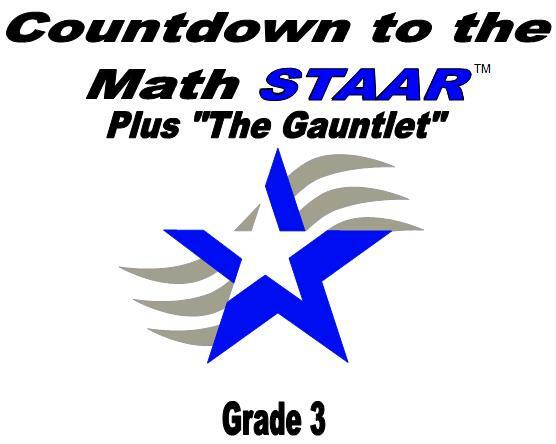 Countdown to the Math STAAR contains ten practice assessments! And each Countdown can be printed on just four to five sheets of paper (front and back)! In just 15 to 30 minutes a day, five days a week, your students complete the equivalent of a STAAR. Recommended by teachers to use in the spring to prepare for the STAAR. The Countdown "Gauntlet" is included with all orders of the Countdown for grades 3-5 this year. 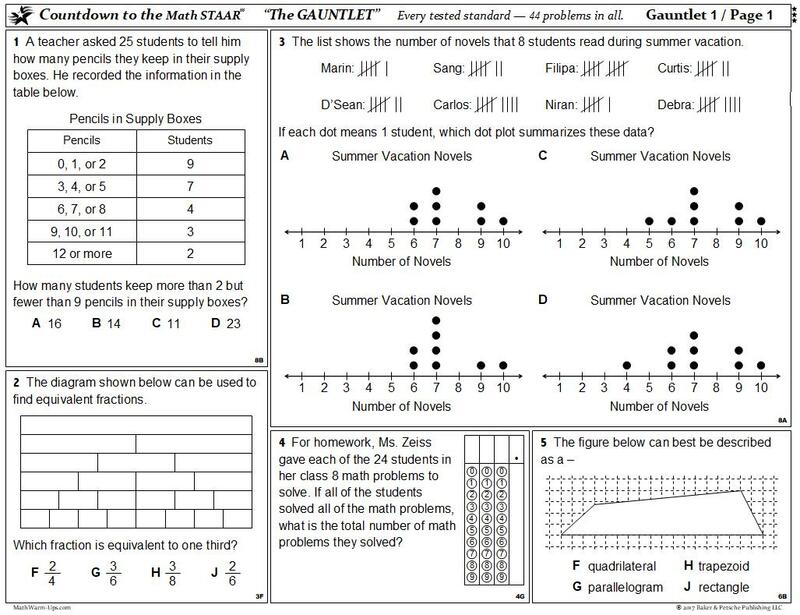 We’ve taken many of the problems from last year’s Countdown along with many new problems and created 5 series of tests, each being 41-44 problems (grade level based) in length. 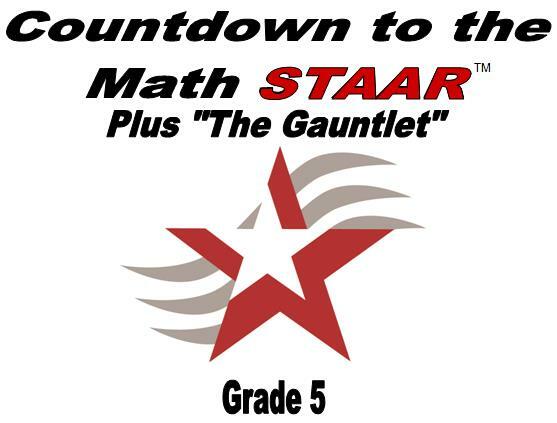 Unlike the Countdown that has the balance and length of a STAAR test, the Gauntlet has 1 problem for each tested standard. The Gauntlet provides a particularly thorough and challenging assessment! With the Quick Track sheet you can identify any deficiencies. You can easily address them with the mini-lessons in Fast Focus, which addresses each standard, one-by-one. 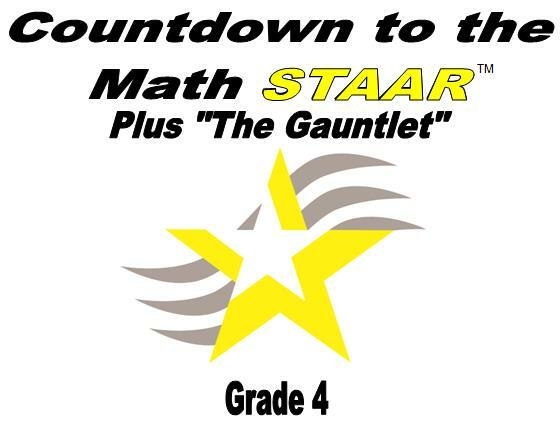 Countdown to the Math STAAR is a powerful product when used alone. Coupled with the new Fast Focus, it's an unbeatable combination! Just ask one of the thousands of Texas teachers who used the Countdown system last year! 4 products combined in a complete set! To order Spanish , click on the grade you want and then use the drop down option for language. For information on the 6th -8th grade Countdown to the Math STAAR. For information on the Countdown to the Algebra EOC. Free Trials for Countdown to the Math. A: Unfortunately, the TEA has only released one test! Q: How is Countdown to the Math STAAR different from Countdown to the Math TAKS? 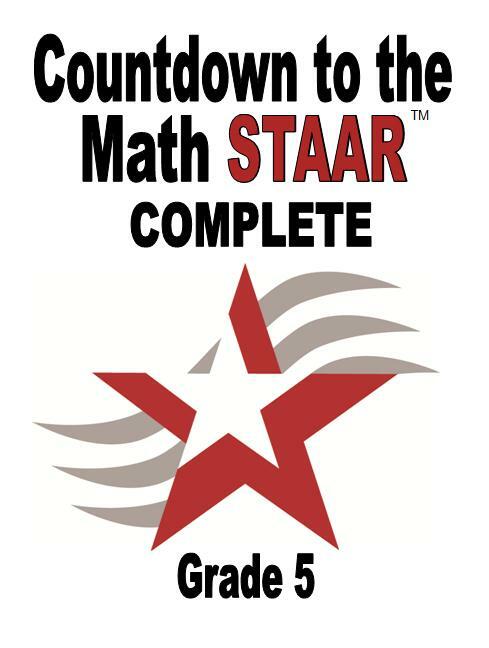 A: Countdown to the Math STAAR and the new Fast Focus have been written from the ground up. More than 80% of the questions on Countdown are new and almost 100% of the questions on Fast Focus are new. The actual STAAR is longer, more rigorous, and includes more griddable response items than the TAKS. The item balance is also quite different and particular emphasis is placed on Readiness Standards. 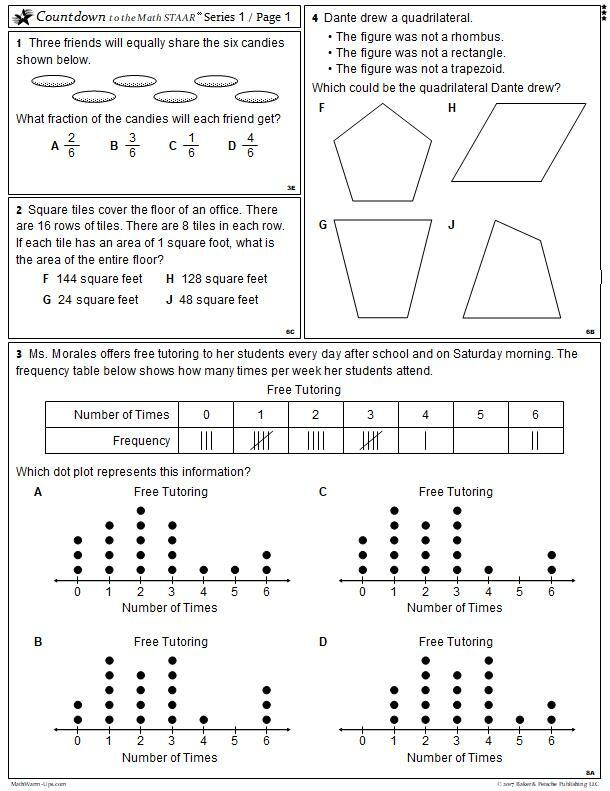 In addition, some of the testable TAKS have changed. The new Countdown has been written to reflect all of these changes. We've also improved the graphics and made the layout much cleaner. Make no mistake; the Countdown to the Math STAAR and Fast Focus are new products! A: As a whole, Countdown is the equivalent of ten STAAR tests. You don't give a whole test at once, though. You simply give your students one or two pages a day for five days (checking it daily). By the end of the week your students have worked an entire test, and you have a whole-test assessment. Imagine repeating this cycle ten times over the weeks just before the STAAR! A: Think about the average STAAR practice book. What do you get? A hundred pages of STAAR material broken down by standard? Maybe two or three pre and post assessment tests? That's a good start, but the notorious data dump phenomenon comes into play. You may cover Recording category 1 in January, but by the time the actual test arrives, your students have forgotten some/much/all of what they reviewed in January. Countdown keeps the standards fresh by exposing students to all of the standards on a weekly basis. Q: How does Countdown work with Fast Focus and Numeracy Power-Up? A: After you've identified the standards your students haven't mastered (using Countdown and Quick Track), pull out Fast Focus and Numeracy Power-Up for a quick tutorial. You've heard of data driven decisions, right? Countdown gives you the data, Fast Focus and Numeracy Power-Up give you the resources to address the data! A: This is a simple tracking sheet that students fill out after checking a page of Countdown with their teacher. With one quick glance, you'll know which STAAR standards a student has or hasn't mastered. Quick Track gives you, your teachers and resource professionals the data to make the decisions. Students love it! Q: Is Countdown available in Spanish?